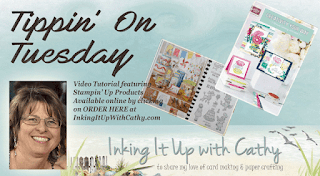 Inking It Up With Cathy: Tippin' on Tuesday - Catalog Review & A Card, Of Course! Tippin' on Tuesday - Catalog Review & A Card, Of Course! In today's Tippin' on Tuesday, I wanted to go through the new 2017-2018 Annual Catalog with you and point out some things to look for in your copy. So check out the video and all the new cool products inside! Wait! I didn't want you to go too long without some inspiration so I thought I would share a card with you today as well. Today is a "Two-for-One" Tippin' on Tuesday! Here is a fun card that we made at a workshop recently. I used the By the Shore DSP which is retired behind the fish but I am sure that you can find something to look like water - maybe some card stock embossed with the Ruffled embossing folder. Here's a tip if you want to recreate this card -- when stamping the rope on the Tangerine Tango card stock, stamp the right side ones first using your grid paper as a guide. Then stamp the ones on the left using the grid paper as a guide as well. Make sure that the ends of the two stampings are where you will be cutt a circle out with your dies on the left side. Another tip is to attach the seaweed to the background paper and cut both together using the circle die. Yes, the card has quite a bit of fussy cutting unless you have a Scan N Cut like I do which means that you just need to stamp your fish, seaweed, anchor and sentiment and then have the machine cut them out!